All seemed in order, but we found that the Discrepancy Note popup was always empty - it was no longer possible to create a new DN. We tried upgrading OpenClinica to 3.11. There was a script to run to remove some duplicate rows, but seemingly no other database changes to make. The new war file deployed fine in Tomcat, and I edited the new datainfo.properties file as required (the structure had changed a bit since 3.0.4 so it was not a simple copy). No luck though. I can get to the login page, and an invalid username/password is rejected. If I put in a valid username and password though I get a 500 server error page. There is no stack trace in the log. Any ideas what the problem might be? Where else should I look for some clues? Is that upgrade path (3.0.4 to 3.11) even supported? The later releases rely on two separate datainfo.properties files. One which is used on initial deployment and one used after the initial deployment. No luck. Still getting "500 - Internal Server Error" after logging in. That second config file was not created after stopping and re-starting OpenClinica, nor after restarting the web server, nor after a reboot. I tried making c:\oc\tomcat\webapps\openclinica.config by manually copying mydatainfo.properties file, but that did not help either. The second file doesn't seem to be created. Could it be a Windows permissions issue with the account not having access to create the folder? It may be worth trawling the Windows Event Viewer tool for any recent issues. It's not the friendliest tool but if you dig deep enough you may just find a clue. Another option is to check your Postgres log files. Other than that I would suggest re-starting the install and follow the installation guide to the letter. I got a fresh vm and have tried a clean install (rather than an upgrade) thinking if I can get it to work there I will migrate the data from the existing server into the new install. I followed the instructions here https://github.com/OpenClinica/OpenClinica/wiki/Install-OpenClinica-v3.6-and-higher-on-Windows with the versions of tomcat/jdk/postgres from the link provided in Step B (https://dev.openclinica.com/oc/software/OpenClinica-3.2/windows/). Steps A to I went exactly as in the intructions. Step J (Verify the Installation) went exactly as the instructions for sub-steps 1 and 2 - the database tables are created in the background. Step 3: I try to log in with the default root/12345678 username/password and the same problem occurs as on my old server! "Oops! An error has occurred"
Also, there is no openclinica.config created at c:\oc\tomcat\webapps. Is it supposed to be a file or directory? The first time you install OpenClinica you will configure datainfo.properties here: c:\oc\tomcat\webapps\OpenClinica\WEB-INF\classes\datainfo.properties. Consequent configuration changes SHOULD be made here c:\oc\tomcat\webapps\openclinica.config. 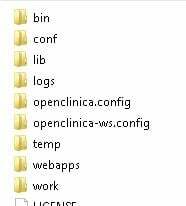 The second openclinica.config directory should be created in c:\oc\tomcat rather than the webapps directory. Note that this is only created when Tomcat is restarted after the initial start. It's a while since I did a fresh install but I think it is very important to not try and log in after the first start of Tomcat which does the deployment. Just check the log that it started successfully then restart it without attempting to access via the front end. You could of course try and restart and see if that helps. You then need to configure the newly created datainfo.properties file within c:\oc\tomcat\openclinica.config and restart Tomcat. Thank you so much for your help @ebs. I very much appreciate it. The question is now what to do if the openclinica-config directory is _not_ created? I tried creating it manually, copying datainfo.properties and restarting tomcat, but it didn't help. I tried removing the tomcat\webapps\OpenClinica and tomcat\openclinica.data directories, dropping the openclinica database and retrying the installation from Step F (copy the war file to webapps\). I made certain I started tomcat started without trying to log in at localhost:8080/OpenClinica . Same result: no openclinica.config directory; "Oops error occurred" following login. - create a database and superuser for OC in postgres. Thanks @lindsay.stevens but again no luck - same result. So it looks like the NPE is caused by digester being null. digester seems to be something to do with setting up the sql queries to run against the database, but I don't know why it would be null here. Also worth checking for end of line characters in the properties file as mentioned in the link.